Are you tired of seeing the “Website Blocked” message for every time you want to access something restricted, like Netflix? Well, there are many solutions to this problem, but the best one is installing a VPN client on your device. 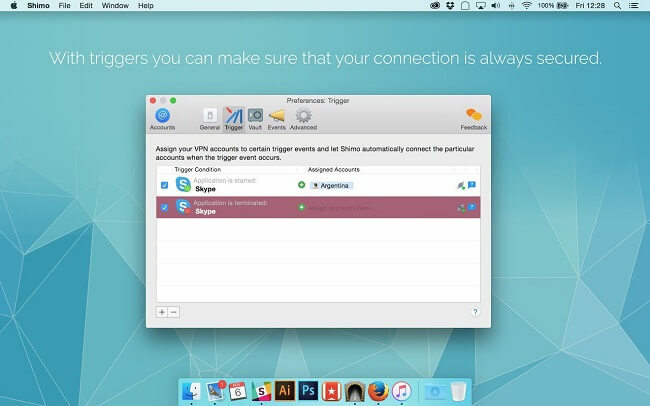 Windows users can get their hands on so many VPN solutions, but Mac users are not that lucky. Fortunately, there is one tool that can aid you at this time and it’s Shimo. If you aren’t aware of Shimo, then now is the time to try out all the remarkable features that it offers. 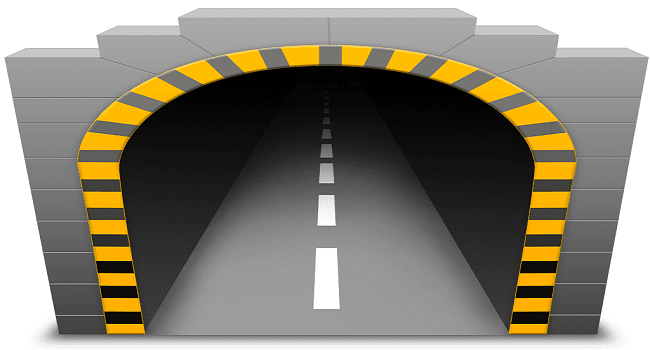 It is a VPN client exclusively crafted for Mac and supports almost every VPN protocol. So you can protect and encrypt your browsing and connection with better security. Also, you can access any geo-restricted website, online service like Netflix, YouTube, Hulu, etc. So without any further talking, let’s dig into all the functionalities and functions of Shimo VPN. Frankly speaking, Shimo is the handiest VPN client that I’ve ever used for Mac OS. It enables you to protect the secure network by accessing the internet anonymously. It supports a wide variety of VPN protocols like OpenVPN, Nortel, CiscoVPN, AnyConnect, IPSec, SSH, and even PPTP/L2TP connections are no problem for Shimo’s VPN client. Shimo works seamlessly and automatically in the background. It protects your network whenever you surf the internet with a browser, encrypts the data, and executes AppleScripts for various events. The tool can do much more than these mentioned features. 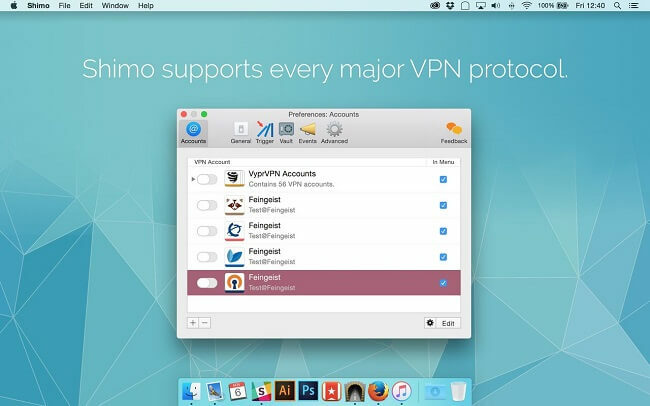 So let’s start the review of Shimo VPN for Mac OS. 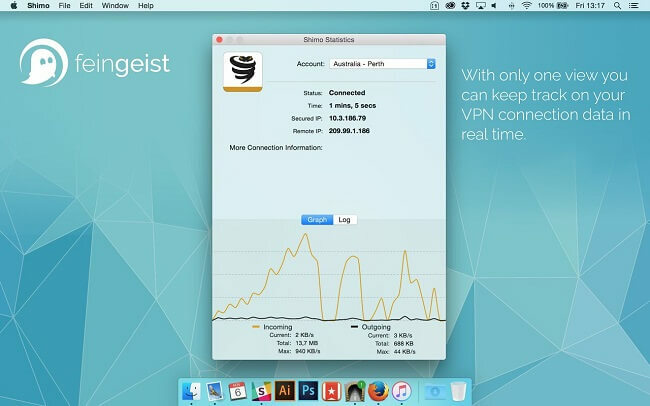 You can start protecting your network by downloading the Shimo VPN for your Mac device. The tool requires minimum configurations, an Intel 64-bit processor, and the OS version should be from OS X 10.9, Yosemite or El Capitan. 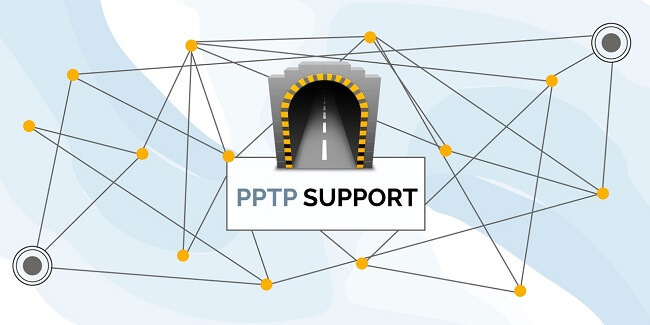 The tool even supports PPTP connections on Mac OS Sierra, the protocol that even the Apple’s VPN client doesn’t support anymore. Even though Shimo is a premium tool, the company offers a trial period for every user to try out all the premium features before purchasing the tool. You can download the free 30-day trial from the official website of Shimo. 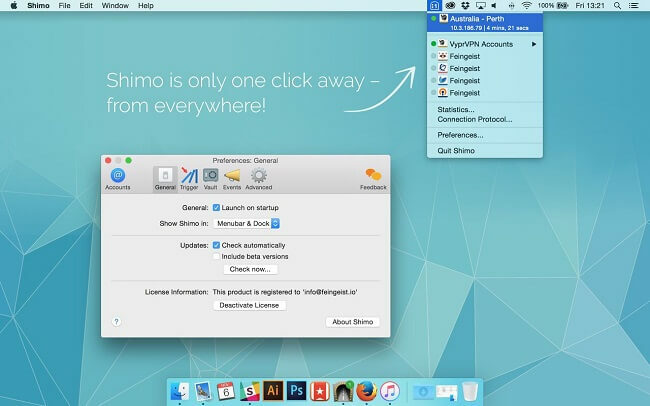 Shimo has already proven its broad range of performance features for all the Mac users. With a premium VPN solution that you can trust, Shimo is currently my priority over any other VPN client. You’re entitled to remove restrictions from any location based blocked websites. Suppose, you want to access Spotify in India, then Shimo would help you to access it. Moreover, all the connections are made by private server networks so that you can rely on Shimo’s security features and data encryption. The VPN allows you to surf across multiple websites over a secure connection, and you can also remain anonymous while accessing any online service. All in All, it is a full-fledged solution to all your Internet restrictions. Talking about the functionalities, Shimo offers a broad range of support and compatibility features for all the Mac users. Here’s a quick glimpse of all the VPN protocols that Shimo supports. Advanced Notifications for AppleScripts, etc. So much does this client charges for all those premium, secure, and performance oriented features? Well, the Shimo VPN client is available for €45 only and includes all the standard VPN protocols like SSH, SSL, OpenVPN and much more. Though it is a great deal for a lifetime license, the company recommends to try out the free version first. It is an excellent way to get a glimpse of all the premium features that Shimo will offer. Shimo VPN is a fantastic choice for any other VPN client due to its large array of features and functionalities. You can purchase the lifetime license for only € 45, with all the standard options. Also, the company provides reliable support to all the users and deploy multiple updates, fixes, and new features with every new version. You can get more information about Shimo here. So this was all about Shimo, and now it is your turn to acknowledge me with any thought, suggestion, or query that you want to share. Please comment if you’re using Shimo VPN on your Mac too. Cheers!